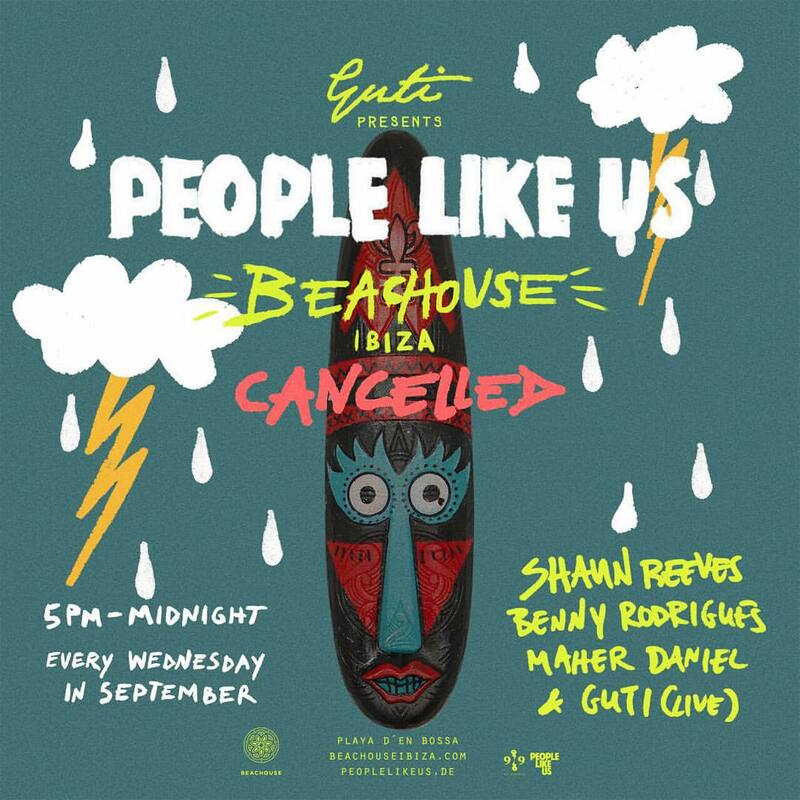 Wednesday, Beachouse Ibiza presents: People like us, with Guti (live), Shaun Reeves and many more. Free party! Sorry, but for weather reasons the party was canceled! Wednesday, 2nd of September, starting at 5 pm till midnight, Guti presents at Beachouse Ibiza: People like us. The line up is interesting and includes Guti (live), Shaun Reeves, Benny Rodrigues & Maher Daniel. The entry – as usual – is free. And, as said the organizers:”After four magical Wednesdays throughout June, People Like Us returns to Beachouse for five more events on the golden sands of Playa d’en Bossa. Once again, long time contributor Guti will be presenting the weekly events, curating a lineup of Ibiza favourites and newcomers alike and providing the perfect summer soundtrack to island life. People Like Us is an infinite story. A story about young people and what they dream, sodden by smooth tape recorded music and a retro future mood. It is a story about fascination for electronic music and collaboration between like minded artists. We share the love of club culture, of the dancefloor, of beach life, of living life. With early roots in the world of jazz, guti’s music crosses cultural borders. curiosity, irony and creativity mark his fusion of musical genres, his exploration into electronic music. it is this boundary blurring attitude that brings the perfect musical harmony between guti and People Like Us. 3rd of September, Eden Ibiza & Next present: Underground party series! 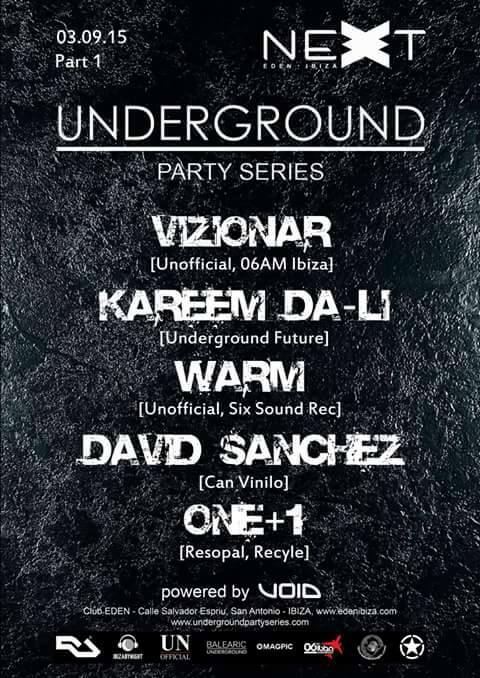 Thursday, 3rd of September, Eden Ibiza & Next presents Underground party series! The line up is composed by Vizionar, Kareem Da-LI, Warm, David Sanchez and One + 1. Venue Address: Eden, Calle Salvador Espriu, San Antonio. Circoloco Ibiza: the set times, with The Martinez Brothers, Nicole Moudaber, Nina Kraviz and many more! Here you have the set times for today, Monday 31st of August at Circoloco. the set times were announced on Circoloco’s fan page on Facebook. Tonight, Luciano and Vagabundos will play at Space Ibiza! Tonight, Sunday 30th of August, at Space Ibiza it’s time for another episode of Vagabundos! And also this week the line up is amazing: with “the Boss” Luciano will play, in the Vagabundos room, Kenny Glasgow and Argy! In the sunset room the line up is composed by Valentino Kanzyani & Djena! Here you have the official poster with the complete line up! 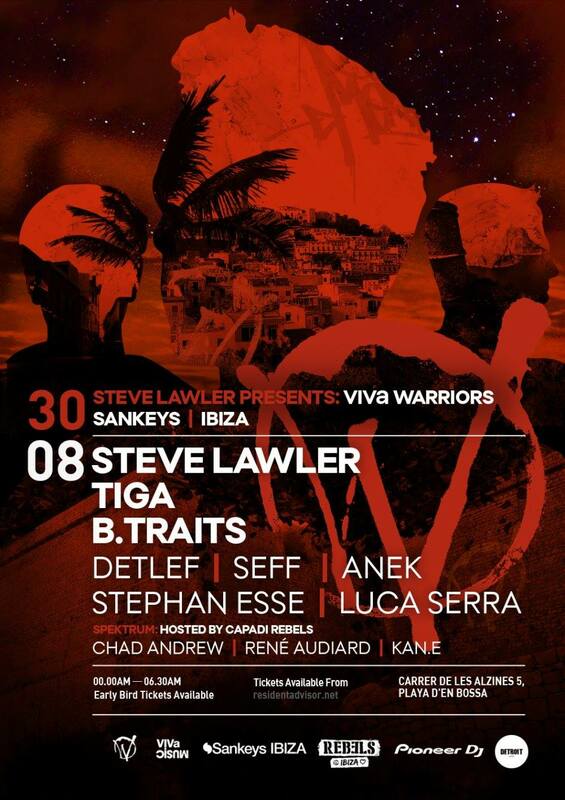 Tonight at Sankeys Ibiza it’s time for Viva Warriors! With Steve Lawler, Tiga, B.Traits, Stephan Esse, Luca Serra and many more! Tonight 30th of August at Sankeys Ibiza it’s time for another episode of Viva Warriors, that party of Sunday night! As usual the main guest will be Steve Lawler, and the line up is completed by Tiga, B.Traits, by our friend Stephan Esse (that has already played also for Ibiza by night radio show, by the Italian dj and producer Luca Serra, Detlef, Seff, Anek! Here you have the poster with the complete line up! Tonight, Pacha Ibiza presents: Solomun + Ame! Tonight, 30th of August, at Pacha Ibiza will be time for Solomun + 1! As we already wrote, Solomun also this third year has confirmed the success of summer 2013 and summer 2014: his party is one of the most liked on the island and has one of the best audience! The team of Ibiza by night visited Pacha the last two Sundays and the club was completely full, the music was excellent and Solomun and his guests played several great sets. The guest of this week is Ame, an artist that we heard several times and we appreciate. Tonight, Heart Ibiza presents: Acid Sundays! Acid Sundays, is one of the coolest parties of Ibiza 2015. with great music and beautiful people. Tonight, 30th of August, will be celebrated another episode of the lucky saga: the line up is composed by Acid Pauli and Tobi Dei plus Kim Ann Foxman in the terrace. If you accept one suggestion of Ibiza by night, this is an unmissable event.Here you have the official poster!